(Bali, February 2018) – Samabe Bali Suites & Villas offers a grand evening to those who wants to celebrate love and romance on Valentine’s Days. Inviting Guests to impress their loved ones with a selection of exceptional dining experiences specially made for the sweet occasion. For lovebirds who want to celebrate romance in the great outdoors, Samabe Bali Suites & Villas present “Love is in the Air” package, an intimate 4 courses at some picturesque venue at the resort. Starting from Pearl Chapel, which can bring you into the amazing night. Romantic Dinner at Pearl Chapel specially prepare for you and your loved one only while enjoying luxurious dishes, the unobstructed Indian Ocean view will be starring your night elegantly. Price starting from IDR6, 950,000 per couple. Our well-known Beach Cave spot, also offers romantic dining. On that special day, the Samabe Beach Cave will be illuminated with thousand lights and fragranced with flowers. The Beach Cave is exclusively prepared for 6 couples only, who are seeking for a city escape and dreamy picture perfect evening by the beach. The diners may feast on a vast dishes, ranging from selections of Prime Cuts BBQ or Seafood to Sticky Thai Rice Pudding with fresh Mango to ended up your night with sweet little touch. This tantalizing offer is available at IDR3,800,000 per couple. 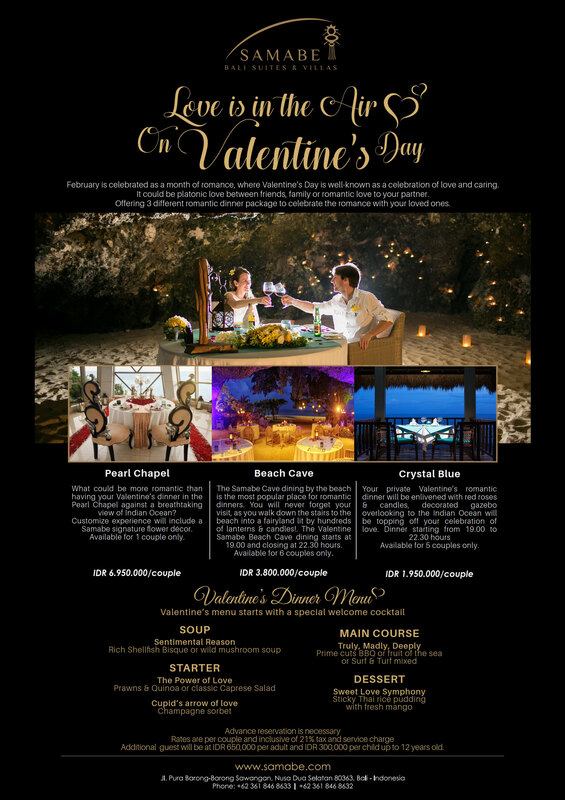 Crystal Blue, the fine dining restaurant at Samabe Bali Suites & Villas will also partake in this month of love with array of mouth-watering dishes. Guests may take their sweethearts to enjoy 4 courses menu with choices of Prime Cut BBQ, Seafood or Surf and Turf. Not to mention, perfect location which overlooking to the Indian Ocean while immerse yourself into the ocean breeze. This package is available from IDR1,950,000 per couple. There is no better opportunity to spoil yourself and your loved ones along the year than on Valentine’s Day. Visit us to book your seat NOW www.samabe.com.